Woman to Woman: Single Saturdays: What Do You Do When All of Your Friends are Getting Married? Single Saturdays: What Do You Do When All of Your Friends are Getting Married? When I was in graduate school I also taught fifth grade full-time. My roommate, who was working on her Masters degree too, taught at the same elementary school I did. Let's just say we were glued at the hips those few years. It was early one Monday morning, and I was at work in the copy room making copies for the upcoming day. My roommate had gone home over the weekend, so we didn't ride to work together that day. As I stood over the hum of the copier I heard someone come in the door. We knew any day now that my roommate would be getting engaged to her long time boyfriend. For some reason that I can't remember, I had a feeling it had happened that weekend. I turned around to see who had come in the door and there she stood. She smiled then reached out her hand for me to see it. Yep, it had happened. A princess cut one-carat diamond ring in a white gold setting sparkled back at me. Now I wish I could tell you that I started screaming and jumping up and down, hugging her neck in pure excitement for her, but I didn't. In that moment I chose my idol of marriage over my friendship. You see, I wanted to be getting married. And I didn't even have a boyfriend. So instead of rejoicing with my roommate, I allowed my jealousy to take over. I stood there and barely smiled. I don't remember what I said, but I'm sure frigid coldness in the room spoke for me. Basically I shrugged her off. A few days later I realized what I had done. I was so ashamed, and I cried as I asked her for forgiveness. That summer she got married. I was in her wedding. Then we moved and went on with our lives. We kept in touch for a while, but then loss contact for no apparent reason. However, I can't help but think that my response to her engagement left a permanent wedge in our relationship that never repaired. So what do you do when all of your friends are getting married? Like many young women, right after college I found myself making a new friend with the alternations lady from all the bridesmaids dresses I bought. I wanted to be the secure, mature friend who was happy for her friends, but all I could do was worry. What if I never get married? Seeing your friends get married when you, too, desire marriage is difficult. I will not try to tell you that it isn't. However, the Bible tells us in Romans 12:9-21 how we are to respond when we feel envy and jealousy. Specifically we are called to "rejoice with those who rejoice" (verse 15). It will be a sacrifice for you to lay down your own desires, your own emotions, your own needs for those of your friends getting married. You will be putting your friends before yourself. The only way you will be able to accomplish this is by renewing your mind so that it is filled with God's truth. However, while your friends will be blessed through your love for them, you will also be blessed by the joy serving them brings you. You will no longer just survive friends' weddings, but you will share in the joy of the moment. 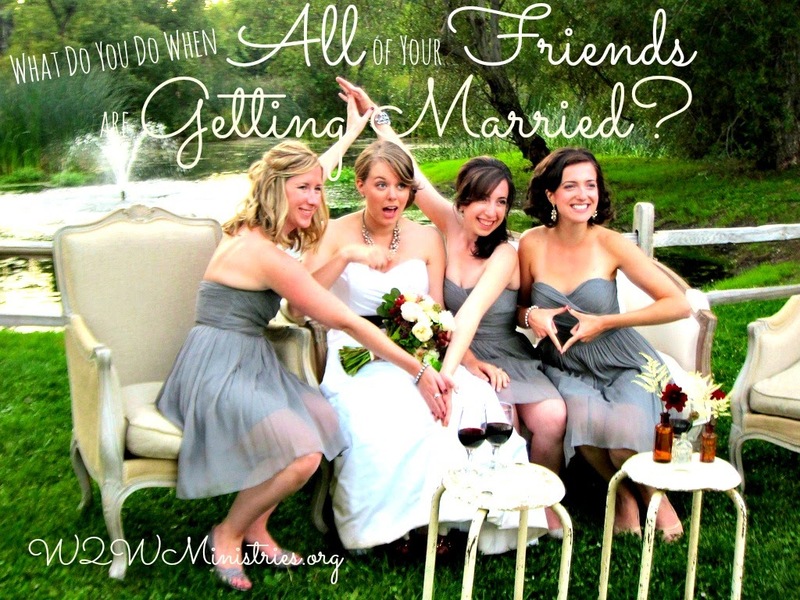 So what are some practical ways you can rejoice with your friends who are getting married? Wow, very timely for me as I expect my flatmate of nearly 10 years is going to be engaged in the next week (ring chosen just waiting for it to be sized and then proposal to take place). I have been asked to be the maid of honour already. At 30 and bridesmaid for the now 4th time, this day coming has been incredibly heartbreaking for me. I am going to live and breathe those scriptures until the wedding is over. With Gods strength hopefully my outcome will be different to yours, but this will not be something even possible to consider without Gods almighty Grace. Searching for Grace, I'm praying for you. I know how terribly difficult it is, but try to remember that his grace is sufficient and His power is made perfect in weakness. Your roommate will be so blessed by your friendship. Many blessings to you! Ugh...getting ready to be a bridesmaid for the 4th time at 27 (woulda been 5th if I could have afforded the other wedding I was supposed to be in), and I'm as single as ever. I'm to the point that I don't know how to rejoice with those that are rejoicing - at least not in my own strength. And so it's all in this, "The only way you will be able to accomplish this is by renewing your mind so that it is filled with God's truth." This is true!! And it is not something we can accomplish by ourselves. Thanks, Brenda, for this timely reminder! Three of my best friends are all getting married in the same three month period. Not only am I going broke buying wedding presents (LOL! ), I'm also struggling with being happy for them while I am perpetually single. Thank you for the encouragement. I am going to post these scriptures some place where I can see them as a daily reminder.